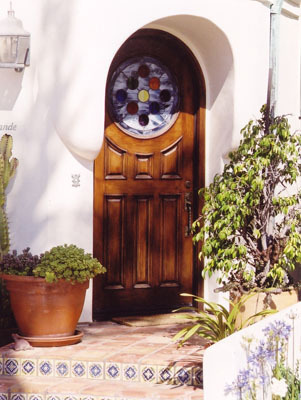 Spanish – RPP Architects & Associates Inc.
A house can express history in its most intimate form. Designed by Roger Peter Porter as a retreat, this residence is the result of traditional Spanish style influence in a contemporary setting. The home conveys a strong sense of history, with a round entry tower, arched windows and doors, tile work, and wrought iron balustrade design. The narrow two-story facade contrasts with a grand two story living room space. 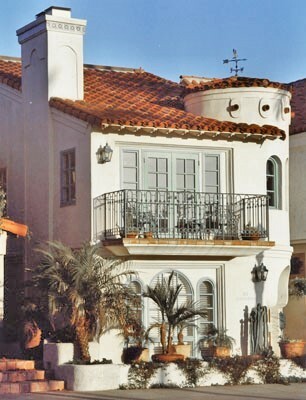 Wrought iron stairs lead to a roof deck, one of the biggest assets of the house. The Spanish style is enhanced by the use of dry-tolerant plants in landscape areas.